Christmas is coming. For some people, that phrase fills them with joy and excitement about the warmth, food, and gifts. But if you will be hosting Christmas dinner this year, let alone a party, it might fill you with dread. Whether your group is a small or large party of family or friends, several supermarkets offer a Food to Order service which could save you hours of stress and toil with shopping, preparing, and cooking for everyone else. Instead, you can simply purchase festive food online and they will either deliver it to your door or you can pick it up from a store. Minimal cooking and setting up is required this way, so you can spend more time with your loved ones. 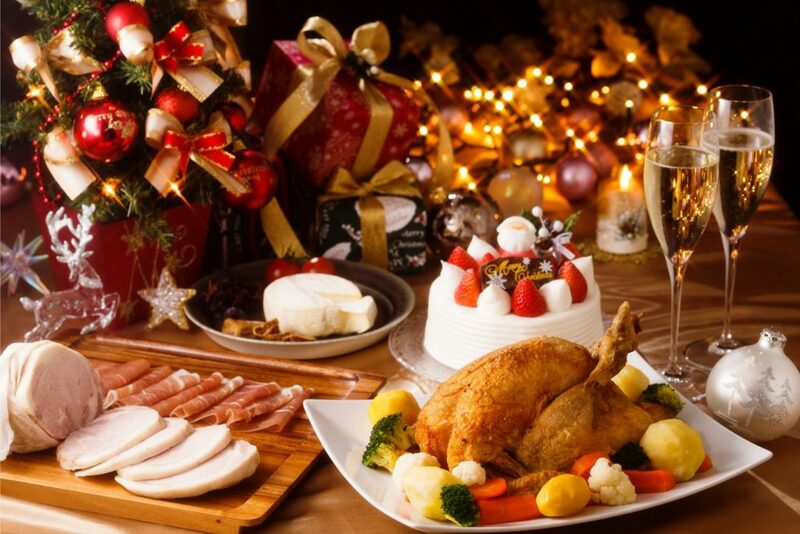 Here is a guide to explain the places you can order Christmas food, how to do it, which foods are available, and how much it costs. Asda offers a quick and easy way to pre-order your choice of meat or fish mains for Christmas. Go online, select a slot for delivery or collection between 21st and 23rd December, add the Food to Order items you want to buy, and check out before 16th December to secure the chosen slot. You can amend your trolley up until midnight the night before your delivery or collection date. A minimum order value will apply, which is usually £40. Only the meat, fish, and poultry selection come under Christmas Food to Order. Asda does offer a variety of special Christmas foods as part of their regular grocery range. Some of these are only available from certain dates. Check the availability dates before trying to place orders for extras like sides, desserts, or party food to avoid disappointment for earlier events. The Christmas mains selection is very affordable at Asda. For £4 each, you can pick up chestnut stuffing, sage and onion stuffing, sliced smoked salmon, or a selection of Christmas trimmings including pigs in blankets and stuffing balls. There is a gammon crackling joint available for just £10. For £13 you could get a topside gammon joint with orange glaze or a small basted turkey. Or for just 20p more there is a pork rib roast with chestnut, cranberry, and orange stuffing, or a small plain turkey. At £15 there is an easy-carve duck with stuffing and cherry port glaze. A stuffed pork shoulder joint is available for £16.50. For £19, you can get a medium turkey, either basted or not, or upgrade to a large for £26. At £20 you could get a turkey parcel with spiced apricot stuffing, or a three-bird roast with stuffing and cranberry glaze. If you prefer beef, there is a sirloin joint for £22 or a rump joint with mushroom truffle duxelle for £30. Or if you prefer lamb, a jewelled whole leg is £26.38, or a triple crown with stuffing and jus costs £28.87. From £30-£40 you could get large or extra large turkeys, turkey crowns, or a Gressingham goose. At Asda, the festive sides for £1.50 include sprouts and bacon, red cabbage, and vegan mushroom and spinach puff pastry parcels. Their selection of pre-prepared sides comes from the regular grocery range. For £1 you can pick up a portion of mash, or Aunt Bessie’s carrot and swede mash or honey glazed parsnips on rollback from £1.75. A mini tray of seasonal roasting vegetables is £1.25, and Asda’s goose fat roast potatoes are only £1.49. The selection priced at £1.50 includes a green vegetable medley, cauliflower cheese, dauphinoise potatoes, or regular roasties. Even Aunt Bessie’s crispy roast potatoes are only £1.80. There are fancier versions of the same ingredients for higher prices. If you would rather save money at the expense of spending more time preparing, you can buy your vegetables fresh from 50p to £1 per pack, or frozen from £1 to £1.50 a bag. If you are a vegetarian, unfortunately, Asda does not cater for this in their mains selection. However, for £1.50 you can buy mushroom and kale sausages or cheese and asparagus tarts. Or for £1.75 there is aubergine parmigiana or tomato and mozzarella ravioli, although this may not feel particularly festive. Quorn has a meat-free roast for £3 as a vegetarian substitute. 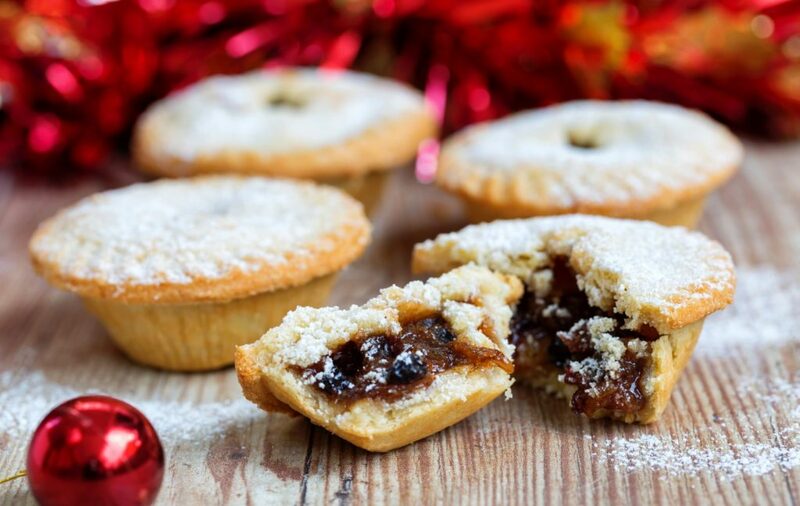 Asda Christmas desserts start off cheap and cheerful. For £3, they offer mini reindeer rolls, vegan dark chocolate and salted caramel pots, or a gingerbread trifle. Step it up to £5 for the raspberry and prosecco panna cotta snow globes, chocolate orange cheesecake, or vanilla cheesecake. At £6 there is a stack of profiteroles with chocolate on top or an adorable chocolate and caramel gingerbread man. For £8 you could get a star-shaped white chocolate and raspberry mousse cake. For £10 they offer a fancy salted caramel and profiterole chocolate gateau, or a rich chocolate ganache cake for £11. If you prefer a cheeseboard to something sweet, there are plenty of them at Asda. Get a range of flavours in 90g truckles for £1 each. 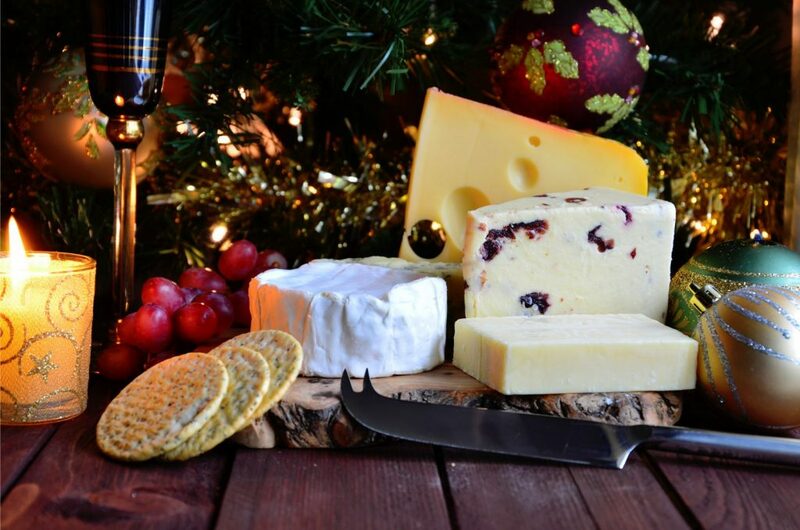 For just £3 to £8 you can get a variety of festive and continental cheeses, meats, and antipasti. You can also pick up some pate for £2 to £3, including a vegan pate from chickpeas. Hosting a party has never been cheaper than when you rely on Asda’s Christmas finger food range. For just £2 each you can serve ham croquettes, prawn toast stars, bubble and squeak bites, stuffed jalapeno peppers, or even pizza. There are also cheese and bacon potato skins for £2.50. At £3 each, pick up a selection of mini quiches, steamed or fried dim sum, jumbo tempura prawns, mini Thai fishcakes, beef Yorkshire puddings, belly pork dippers, or hoisin duck skewers. Asda also offers 50-piece party platter selections of Tex Mex, Oriental, or Indian food. The Tex Mex selection includes spicy potato wedges, garlic mushrooms, onion rings, and sweetcorn and jalapeno fritters. Indian includes chicken tikka samosas, vegetable curry parcels, onion bhajis, and vegetable pakoras. Lastly, the Oriental pack includes prawn toast, chicken curry parcels, sweet and sour vegetable wontons, plus vegetable spring rolls. The Festive Food to Order range at Morrisons is available for Christmas and New Year. They do not deliver these orders, which means you must collect them from a chosen Morrisons store yourself. The Christmas orders will be available for collection between 14th and 24th December. New Year orders must be collected on 31st December. Go online, select your store for collection, pick a date and time slot, then place an order for a selection of festive food. You must pay a deposit to pre-order, then pay the remaining balance when you collect. Product availability may vary depending on location, so you might want to switch stores if something you really want is unavailable. For affordability and a great range of choice, Morrisons is the place to go for a stress-free Christmas dinner or party. For just £10 each or less, there is a variety of meat available. This includes a leg of pork, Hampshire pork fillet with cranberry stuffing, turkey and pork crackling, glaze-roasted ham, turkey breast, Wiltshire cured gammon joints, and chicken stuffed with pork and caramelised onion with a bacon lattice. From £10 to £20 you can get a leg of lamb, easy-carve stuffed duck, stuffed turkey breast and thigh joint, aged sirloin joint, ham on the bone, trimmed forerib of beef, or a three-bird easy-carve roast with turkey, chicken, duck, and stuffing. Whole turkeys are available from £7.60 or turkey crowns from £12.60. For £5 you can get king prawns in blankets or some prawn cocktails for seafood. Most of the seafood options are better for starters or buffet food at larger gatherings and dinner parties. Morrisons offers a few vegetarian dishes for mains at £5. These are mushroom, spinach, and Madeira en croutes, cranberry and pistachio nut roast, or jewelled rice and pearl barley bakes. These serve 2 people. Side dishes are available from £1.50 each, including sprouts and chestnuts, spiced red cabbage, honey and mustard parsnips, and cranberry sauce. For £2 there are goose fat roast potatoes, baby parsnips with a salted caramel glaze, carrots and parsnips with a cumin and apricot glaze, or turkey gravy. At £3 there are pigs in blankets, sage and onion stuffing balls, pork and onion stuffing parcels, and bacon wraps containing pork, apple, and cranberry stuffing. There are also venison pigs in blankets or chipolatas in bacon for £3 each. These generally contain 3-4 servings, so you may need to buy multiple to suit the size of your party. Make sure that there are enough of the trimmings to go around! The Christmas desserts from Morrisons may be cheap, but that doesn’t mean they aren’t decadent. At £2 you can pick up some standard mince pies or black forest Christmas tree meringues. There is a strawberry trifle at £3, or shimmering macarons for £3.50. For £4 each you could serve a chocolate fudge Yule log, or a selection of funsize treats. These include raspberry and prosecco fizz jelly pots, salted caramel and Irish cream mini tarts, mini melt-in-the-mouth chocolate puddings, mini cheesecake pots, and mini pots au chocolat. Get a Christmas pudding for £5, or a platter of Christmas cupcakes for £6. There is also a cute polar bear cake for £6. At £7, there is a sherry trifle, a Belgian chocolate and salted caramel layered bowl, or a rapsberry and prosecco panna cotta wreath. Or for £8 go for a sharing platter of mini sponge cakes, a fresh cream strawberry gateau, profiteroles, or a bûche in chocolate and salted caramel or passion fruit. With the most expensive desserts being £9, you won’t be breaking the bank even if you opt for the snowflake tiffin, carrot and walnut cake, lemon meringue pie, or mini chocolate Christmas trees. If you want some savoury as well as sweet, there is a festive cheese board for £6 or cheese platters for £10. Morrisons Christmas or New Year party food starts at £1.50 for a vegan platter. Sausage rolls are available for just £2. There is a range of finger foods on offer for only £2.50 each. These include mini loaded potato skins, chicken skewers with sweet chilli dip, mushroom arancini, mozzarella sticks, and vegetable tartlets. Or for £3.50 you can get duck straws, tempura prawns, BBQ pork belly bites, ham and truffle tartlets, or churros. There are also little meat treats such as mini beef wellingtons, mini steak and ale pies, and mini chorizo pigs in blankets. For just £6 each you have a choice of sandwich platters, a savoury snacks platter, a selection of breaded chicken, crudité or mixed salad platters, or a selection of Indian or Tex Mex nibbles. The cooked meats platter costs £8, and even the premium sushi platter is only £12. If you do want seafood, start at £6 each for crab verrines, prawn and cucumber mousses, salmon and prawn cheesecakes, or king prawn and salmon terrines. Mini coquilles St Jacques are on offer for £7, or splurge £10 on lobster, prawn, and prosecco knickerbocker glories or £12 on large prawn cocktails. Booking your Christmas dinner from Tesco is easy. You can go into a participating store and place the order in person between 6th November and 5th December. Submit your order, choose your collection date and time, and pay your £10 deposit. Alternatively, order online for home delivery or Click+Collect. Online ordering opens from 26th November for Delivery Saver customers, and 30th November for everyone else. You must check out before 11.45pm on 14th December to place the order. You can collect in-store orders from 22nd to 24th December. Online orders for Click+Collect will be available from 20th to 23rd December, as will home delivery, though selected stores offer home delivery on 24th December too. Choose your date and time slot when ordering, according to availability. Whole turkeys from Tesco range from £18 to £60, with turkey crowns ranging from £15.99 to £42. Some come with flavoured stuffing and/or a bacon lattice. For as little as £10 you can get a basted turkey joint with black pepper, or turkey breast with pork, Bramley apple, honey, and sage stuffing for £20. You can get a whole chicken for £9 if you prefer, or a Wiltshire gammon joint for £9.60. For £10 there is a chicken crown with stuffing, a two-bird roast stuffed with pork and apple, or a stuffed three-pork roast for £10.50. A Gressingham whole duck ranges from £8 to £15, or you could get an easy-carve lamb shoulder for £14 to £30. A venison rack starts at £21.60, a lamb guard of honour at £23.33, a pork crown at £26.35, beef rib with mustard at £26.40, and sirloin wing rib at £37.50. Prices increase according to weight. Seafood starts at £8 for smoked salmon cheesecake canapes or king prawn cocktails. At £12 there is a shellfish coquille medley or prawn, lobster, and rocket verrines. For £14 they offer a Scottish salmon en croute with lemon butter stuffing, get lobster tail Thermidor for £18. If you prefer goose they range from £36 to £48, or if you prefer beef the Aberdeen Angus wellingtons range from £36 to £44. For couples or parties of two, Tesco offers a Christmas Dinner for Two bargain deal. For just £35 both of you can get turkey breast wrapped in bacon, goose fat roast potatoes, pigs in blankets, Yorkshire puddings, thyme-roasted carrots and parsnips, cauliflower, broccoli, and sprouts, sage and onion stuffing, turkey gravy and cranberry and port sauce, cider and Courvoisier vs cognac Christmas pudding with brandy sauce, plus premier Cru champagne and even some Christmas crackers. The few vegetarian-friendly Christmas mains at Tesco include £6 for two cauliflower wellingtons, £9 for half a butternut squash stuffed with beetroot and apple, and four wild mushroom and spinach vol-au-vents or brie and cranberry filo parcels at £10. There are plenty of side dishes starting from £8 for a ready-to-cook fresh vegetable selection of parsnip wedges, carrot batons, Maris Piper potatoes, shredded red cabbage, and Brussels sprouts. For £9 there is a sausage pastry garland, or for £10 a selection of sausages and stuffing or 36 pigs in blankets. Their £12 vegetable selection includes ready-to-roast potatoes, honey-glazed parsnips, cauliflower cheese, red cabbage with apple and redcurrant jelly, and sprouts with bacon bits. For £12 you can also get a selection of mini Yorkshire puddings, half filled with roast beef and creme fraiche and half with turkey stuffing and cranberry sauce. Or for the same price there is a selection of vol-au-vents, including six each of tomato and feta, bacon and mushroom, cheese and chorizo, and goat’s cheese and onion chutney. These can also be used as party platters as well as dinner sides. The selection of Christmas desserts at Tesco is admittedly smaller, but they are no less decorative and indulgent. They are also quite affordable for luxury themed desserts. The range begins at £6 for a classic chocolate Yule log or 18 mini Christmas cupcakes. For £8, you can indulge in a mandarin and ginger layered dessert, 12 caramel-filled vanilla cupcakes, or four individual Black Forest snow globes. Next, at £10, they offer a spiced “Magical Woodland” cheesecake, a sticky toffee wreath, four Belgian chocolate and caramel trees, or selection of 18 mini puddings. If you would prefer mini choux pastry, there is a 36-piece selection for £11. At £12, they offer a Christmas snow globe trifle, 24 French macarons, or a chocolate orange and ginger cake. Finally, the showstopper of Tesco’s Christmas desserts is a croquembouche of 60 profiteroles costing £15. There is less choice for cheese, but you can buy a wheel of Stilton for £10 or a cheese selection with crackers and chutney for £20. The five-tier cheese celebration cake at £30 is better for parties, as it serves 30. It contains cheddar, red Leicester, Stilton, Wensleydale, and brie. The party food selection at Tesco kicks off with a Mediterranean antipasti sharing platter for 10 at £8. Also for £8, you can serve 48 smoked salmon appetizers, 30 sticky chicken skewers, a 48-piece Indian selection, or a 32-piece selection of breaded cheese. You can provide a meat pate or fish and veggie pate selection for £9 each. Or for £10, serve up a 52-piece Chinese selection or 24-piece pork pie selection. There is a platter of cooked meats for £11, or a selection of sausage rolls for £12. Also for £12 each, Tesco offers a 30-piece prawn selection, 24-piece smoked salmon blini canape kit, 24-piece mini American party food or 24-piece mini vegetarian sliders. At £14 you can opt for a vegetarian gala pie serving 12 or a tapas platter serving 8. A cranberry-topped pork pie is available for £15. At £20 you could provide a spiced rum-cooked ham joint, or for £30 a matured Spanish serrano ham with 40 servings. 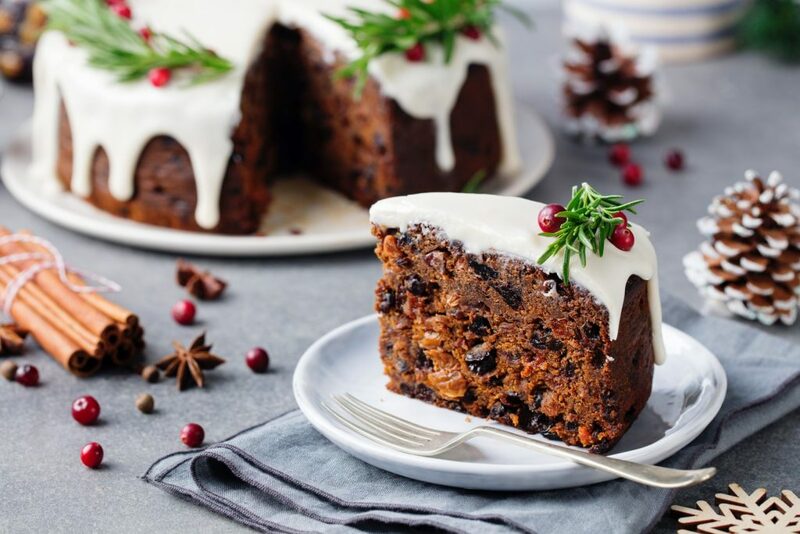 Sainsbury’s Select is the next step up for Christmas Food to Order. Go online, select a store and the date that you want to collect the order, browse and select the food, then place the order and pay a £20 deposit. You will pay the rest of the outstanding balance when you collect the order from your chosen Sainsbury’s store. Christmas Food to Order is available to collect on 22nd, 23rd, and 24th December. They are running a promotion offering a voucher for a free Christmas pudding when you place an order of at least £80 before 2nd December. It is for a 900g cognac-laced 18-month-matured Taste the Difference pudding, which normally costs £9. They will award the voucher for eligible orders upon collection. Your ability to redeem it will depend on stock availability at your store on that day. At Sainsbury’s, the cheapest turkey crown is £20, with the most expensive free-range game-hung turkey costing £71.99. In between these prices, there is a variety of whole turkeys and turkey crowns, some with bacon lattices or flavoured stuffings. A two-bird roast containing pork, apple, and cranberry stuffing costs £12.50. An easy-carve guinea fowl with apple and Armagnac stuffing is available for £20, or a half leg of lamb in mint and redcurrant jelly. For £25 there are beef joints with different dressings, a salmon, cod, and prawn roast, or an easy-carve duck with pork, blood orange, and sloe gin stuffing. For cheaper mains, there is a beef shin casserole for £10 or two Dover sole in caper butter for £14. At £15, they offer a beef, chestnut, and mushroom pie, or a pork joint with chestnut stuffing and sticky apple glaze. A gammon joint with citrus glaze is also available at £15, or for the same price get mulled-spice-infused gammon with a Christmas pudding marmalade glaze. Otherwise, it costs up to £60 for beef rib or Wellington, or up to £65 for beef fillet. For seafood, there are two dressed lobsters for £18, or smoked salmon terrine slices for £9.50. There are also 4 salmon, mozzarella, and tomato tarts for £10, which can also be starters. The meat-free options at Sainsbury’s include potato dauphinoise for £4 and maple-glazed sweet potatoes for £5. There is a 3-nut and mushroom roast with redcurrant and port gravy for £5 as well. Layered root vegetable stacks are available for £6.50. Spice things up for £8 with a jewelled squash and red pepper pilaf, plus a cranberry and pomegranate glaze. At £8 there are mushroom and butternut tarts, or truffled cauliflower cheese en croute for £9. They offer a £14 vegetable selection serving 4-6 people. It includes roast potatoes, honey and mustard parsnips, cauliflower cheese, braised red cabbage, and sprouts with bacon and chestnuts. The £18 selection of vegetables serves 6-8 people and includes roast potatoes, parsnips, sprouts, carrot and swede crush, cauliflower cheese, and Yorkshire puddings. Other sides include a sprout, chestnut, and bacon gratin for £5. There are also pork chipolatas wrapped in bacon or pork, apple, Armagnac, and bacon parcels for £6. These are essentially fancy pigs in blankets. The Christmas desserts from Sainsbury’s Select start at £9 for a Madagascan vanilla panna cotta with a prosecco and raspberry compote. The next price point is £10, including a tarte au citron and a Belgian chocolate and salted caramel tart. It also includes a chocolate and salted caramel cake in the shape of a golden Christmas pudding, and a Sicilian lemon and passion fruit snowflake bombe. There is also a family-friendly Rudy the Reindeer chocolate cake with a hidden centre of shortcake snowballs. Go luxurious for £12 with a salted caramel choux wreath or a melting Belgian chocolate billionaire’s dome. Or for the same price, treat the adults to 18 cocktail jelly shots. There is another Belgian chocolate and salted caramel dessert for £14, only it is in the shape of a star. For £15, you could get a “falling leaves” Christmas fruitcake, or a selection of 24 mini tarts with four types of silky filling. Sainsbury’s offers a cheese selection complete with acacia wood board for £22, plus fig flatbreads, oat digestives, and chutney. Sainsbury’s Select doesn’t quite do buffets. If you’re hosting a dinner party on a budget that allows you to shop at Sainsbury’s, you can probably afford to assemble something out of the Christmas sides, if not the mains. However, they do offer sharing options which can fill out a party table. Generally, these serve 2 to 32 people. At £7.50, these offerings begin with a sausage and apricot wreath with cranberry and gin sauce. Next at £8, there is an olive and antipasti selection, or a selection of 27 sausage rolls for £9. Invest in a pork, chicken, and stuffing layered pie for £12. Increase the sharing with a fruit-topped luxury pate selection for £12.50, or a 32-piece selection of cheese filo tarts for £13.50. For 316.50, you could invest in a whopping 100-piece selection of international snacks including Indian, Oriental, and American cuisine. Although this only serves 9, you could indulge in a seafood platter for £30. To order specially-prepared Christmas food from Marks & Spencer, go online and select your store. Home delivery is not available, so you will have to go to the store to collect the full order. You should book as soon as possible to secure your slot, as some dates get very busy. Browse, add your chosen products to your basket, then pay the non-refundable deposit. This will either be £30 or the total cost of your order if it is less than that. You can place orders for both Christmas and New Year up until 5pm on 15th December. However, you can only amend orders until 10th December. Amendments are subject to availability and may affect your collection date. Christmas collections are available on 22nd, 23rd, and 24th December. New Year collections will be on 30th and 31st December. You must be able to display your e-mail confirmation to collect your order instore. The store will hold your order for 2 hours. The price point starts at £12 for seafood starters. These include twelve oysters, four salmon and king prawn stacks, or four crab and avocado spheres. Serve 2-4 for £15 with a half-leg of lamb, sugar-baked gammon, beef topside with mustard and herb basting fat, easy-carve pheasant with pork and cranberry stuffing, or a pair of easy-carve partridges with pork, pear, and sage stuffing. For £17 they offer a beef bourguignon, or a turkey crown for £18. At £20 you can pick up lobster and prawn Thermidor shells, venison casserole, beef and bone marrow pie, beef rump wrapped in prosciutto, a venison joint with plum and sloe gin stuffing, or a Porchetta joint with garlic, lemon, and sage. 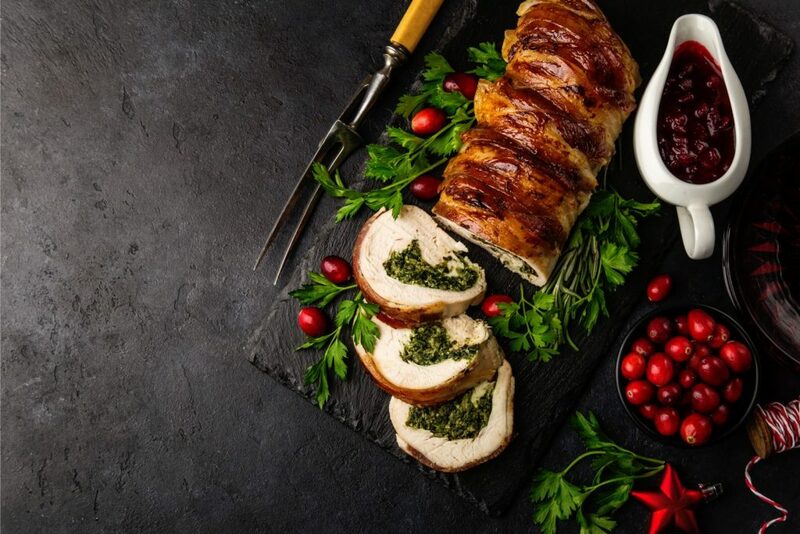 Jumping to £25, there is a choice of Oakham turkey breast parcel, Scottish Lochmuir salmon en croute, bone-in monkfish tail wrapped in Pancetta, a salmon side with a prosecco glaze, or duck roulade with pork and plum stuffing. For £28 you can get boneless Oakham turkey breast with pork, sage, and onion stuffing. Turkeys range from £31 up to £90. If you prefer fish, for £30 there is a butterflied whole sea bass or a three-fish roast with salmon, haddock, king prawns and cheddar and leek stuffing. For a luxury bird roast, at £35 there is a turkey, chicken, and duck three-bird roast with pork, plum, and sloe gin stuffing, wrapped in bacon. Or for £40, indulge in a three-game roast of pheasant, partridge, and pigeon with pork, apple, and Calvados stuffing, wrapped in bacon as well. For the same price, you could pick up four halves of dressed lobster. Or drop back to £37.50 for a fillet of beef. For vegetarians in your group, you can grab four servings of a meat-free main for £7. These are butternut squash and sweet potato rosti, ricotta stacks, or mushroom Wellingtons. Or for £7.50, a vegan butternut, almond, and pecan nut roast will also serve 4. Potato gratin dauphinoise is available for £8, or a parsnip, camembert, and chestnut pithivier for £10. A luxury Cornish Cruncher cheese and cider bake will serve 8-10 for £12. Christmas dinner sides begin at £5 for cauliflower cheese and £7 for red cabbage. For £10 you can get a selection of pork cocktail sausages wrapped in bacon (pigs in blankets) and pork, sage, and onion stuffing balls, or a wreath of pork, chestnut, and thyme stuffing. Their vegetable selection for four costs £15 and includes roast potatoes, parsnips, carrot batons, and sprouts. There is also a luxury vegetable selection for six at £25, which includes red cabbage, sprouts with bacon, chestnuts and caramelized onion butter, honey roast parsnips, goose fat roast potatoes, carrot and swede crush, and cauliflower cheese. They have a range of salads available at £12.50 for light meals or sides. The range of Christmas desserts at Marks & Spencer begins with a fairly basic New York cheesecake for £6. Next, they offer a billionaire’s dessert or a melt-in-the-middle chocolate and salted caramel Christmas pudding for £10 each. 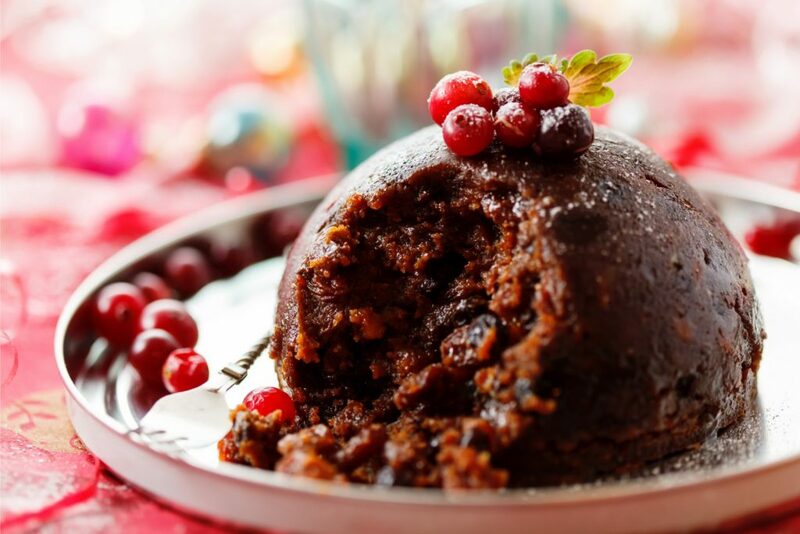 At £12, you could get a raspberry crown trifle, a golden Belgian chocolate sponge pudding, prosecco-and-orange-topped Christmas pudding, or a 12-month-matured fruity Christmas pudding. For £13 they offer chocolate pinecones, a “Winter Wonderland” cheesecake, and a child-friendly “Holly and Jolly” snowpeople dessert. Options for £15 include a snow bombe, profiteroles, a raspberry and prosecco panna cotta terrine, a 12-piece macaroon gift box, a Christmas postbox cake, a glossy Belgian chocolate and hazelnut mirror glaze cake, or a “Santa’s Rooftop” chocolate and caramel Yule log. For the same price, they also offer a selection of 27 mini treats, which includes pecan tarts, chocolate ganache bites, millionaire’s tarts, and cheesecakes. Invest in a six-month-matured golden shimmer Christmas tree cake for £20, or a Belgian chocolate and cherry dessert. On the savoury side, there is a cheese bite board or a cheese and chutney selection for £30 each. These can serve 10 to 20 people for parties. Marks & Spencer is known for its Food to Order for occasions year-round. Their festive party food selection contains a few seasonal additions. This begins with their ultimate Yuletide log sausage roll or handcrafted Christmas sausage roll garland for £8 each. There is a Brussels pate for £10. For £15 you could serve prawn cocktail, a layered salmon bar terrine, or a Spanish meat and Manchego cheese platter. Or they offer an Italian meat and antipasti platter for £20. At the same price, there is a hefty handmade Tudor pie containing pork, turkey, cranberries, chestnuts, stuffing, and port jelly. Offer your guests a seafood selection for £25 with a fish snacking platter or a luxury prawn platter. For £30 you could display a London-cured ham (with around 20 servings) or a sweetcure ham with a mulled wine and plum glaze (with around 25 servings). You can supplement your spread with their regular party food options. These include canapes, vol-au-vents, sandwiches, wraps, rolls, cold meats, pies, and bite-size sweet and savoury snacks. Not to mention their vast selection of beautiful non-seasonal cakes! For Christmas Food Made to Order at Waitrose, you have multiple options. You can order online, over the phone, or at the Welcome Desk in-store. Home delivery is available when you spend a minimum of £60. Otherwise, you can collect your order from your chosen Waitrose branch without a minimum spend. Last orders for Christmas are on 15th December. Orders for New Year close on 21st December. You can choose a delivery or collection date from 21st, 22nd, 23rd, or 24th December, depending on availability. Some meats are available for collection or delivery on 20th December, so check on the dates. New Year orders will be ready from 28th, 29th, 30th, or 31st December. For a traditional Christmas dinner, at Waitrose the prices start from £17.98 for a turkey crown then £23 for butter-basted turkey breast with a bacon lattice and stuffing balls. From there the prices graduate up to a steep £106. The range includes turkey breasts, crowns, thighs, and full turkeys, some with a variety of stuffings. These include such flavours as gingerbread and apricot or shallot and wild sage. There are joints available for as little as £13, including pork crackling or honey and mustard beef roast. At £15, you can get beech-smoked Muscovado-glazed gammon or a seafood platter. For £18, Waitrose offers smoked trout, pea, and lemon verrines, or king prawn cocktail. Then at £20, they have a dressed Canadian lobster or 24 smoked salmon rolls. Jumping to £27, there is a free-range pork leg joint or a whole Scottish salmon fillet. Next, at £28 there is a salmon en croute or a pork hog roast with sage and onion stuffing and apple sauce. For £30, the options include beef topside, boneless leg of lamb, whole duck with orange and juniper glaze, or free-range guinea fowl with pork, apricot, and red onion stuffing. Ranging between £30 and £40, there are racks of pork, dressed legs of lamb, or unsmoked boneless gammon. Then in between £40 and £50, they offer a slice smoked salmon side, crackling gammon, whole Scottish salmon, beef sirloin, matured beef rump, or the luxury shellfish platter. You could also choose the shellfish platter for larger Christmas parties. Unfortunately, Waitrose does not offer much in the way of meat-free festive meals. The mains options include a vegan nut roast with cranberry drizzle for £11, or brie and cranberry filo parcels for £12. Other than this, there are various salads for £7, or pesto pasta with spinach and pine nuts. There are also parsnip rosti stars for £7.50 and potato rosti Christmas trees for £8. A side dish of cauliflower cheese is available for £10, or a vegetable quiche for £18.50. For parties, Waitrose does offer vegetarian platters of sandwiches, tortilla wraps, and even sushi. Sides with meat begin at £4.29 each for pork or venison pigs in blankets, chestnut and bacon stuffing balls, and pork, butternut squash, and chestnut stuffing balls. At £5.50 there is mashed potato, roast potatoes, or red cabbage. Then at £6.50 each you can choose from a vegetable selection, Chantenay carrots with a bitter orange and juniper glaze, Brussels sprouts with cranberry and roasted pine nuts, a vegan cauliflower and broccoli bake, or a potato, roasted garlic, and rosemary bake. At £7 there is a selection of roasting vegetables or a sausage wreath with a cranberry glaze. For £13.69 you can serve a 44-piece selection of pigs in blankets and sage & onion stuffing balls. The entry-level Christmas dessert for Waitrose is chocolate profiteroles at £8. An assorted fruit platter is available for £8.50. Try out the chef Heston Blumenthal’s Waitrose-exclusive cracking chocolate bites for £9 or cracking chocolate tart for £10. For £11, they offer a berry medley, a Sicilian lemon tart, or a salted caramel and chocolate tart. Then at £12, there is a chocolate and hazelnut tart or vegan-friendly pineapple and coconut milk panna cotta pots. Or get raspberry panna cotta pots for £13. For just 50p more you could try a mixed berry cheesecake, a dark chocolate and orange tart, or Heston’s chocolate Bucks Fizz swirl. At £14 they offer a selection of mini tarts, twelve festive cupcakes, a chocolate and salted caramel bar, or passion fruit and raspberry swirl. Keep the vegans happy for £15 with berry crumbles or chocolate tortes. Take it savoury with a three-tier cheese cake for £17.50, or five-tier for £20. There is also a British or Continental cheese selection for £22 each. The Christmas-themed cakes are on the expensive side. A festive parcel cake or chocolate drip cake will set you back £25. Heston’s postbox cake, a chocolate and orange fruitcake, or richly fruited holly cake are all £30 each. For £30 you can get a trio of festive cakes, shaped like a present, a snowman, and a Christmas pudding. One is a golden sponge with raspberry jam and vanilla buttercream, one is a chocolate sponge with chocolate buttercream, and lastly one is a rich fruitcake laced with brandy, all covered with soft icing. There are rings of various types of cheese available for £30 to £40 as well. Waitrose offers a range of canapes, from toad in the hole mini Yorkshire puddings or breaded prawns for £13 and vol-au-vents for £14.50. There are mini pork and chorizo burgers for £14. From £17.50 to £20 you can get a selection of smoked salmon. Or invest in a 50-piece mini Indian snack selection for £20 or Chinese selection for £23. 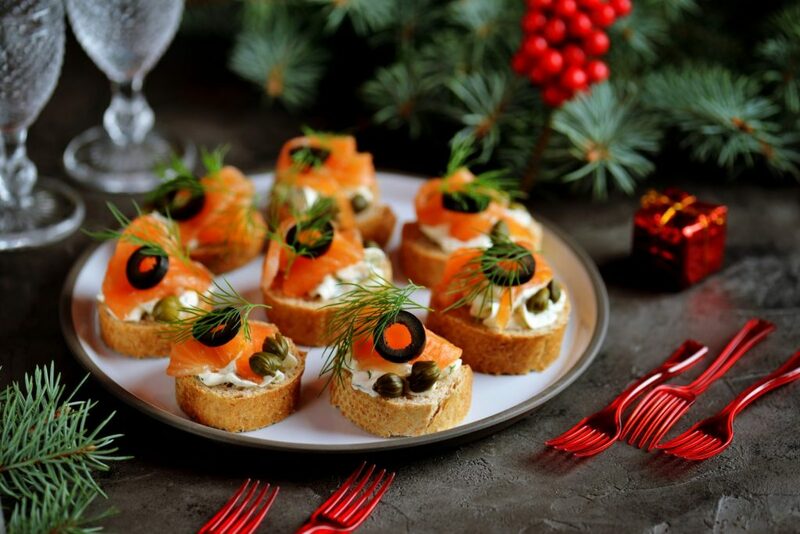 The larger selections of canapes go up to £38. There are plenty of sandwich, roll, and wrap platters available to serve 4 to 6 people. These include vegetarian and gluten-free options, and range from £12 to £21. They also offer sushi platters from £16 to £32. There are also plenty of meaty pie options for a buffet. This includes a gala pie for £16.50 and a chorizo, red pepper, and Manchego tortilla for £21.50. There are two types of vegetarian cheese quiche for £19.50 each. Cured ham and roasted beef are available for over £50. Or get a platter of assorted cooked meats or a continental meat selection for £18 each. An antipasti platter is available for just £12. There is a variety of seafood, too. The range includes mini dressed crab for £12, a seafood platter for £15, king prawn cocktail for £18, and smoked or poached salmon for £40-£47. Of course, they also have a variety of delicious salad bowls and cheese. The latter options include full wheels, selection boards, or multi-tier cakes which can cost up to £150.